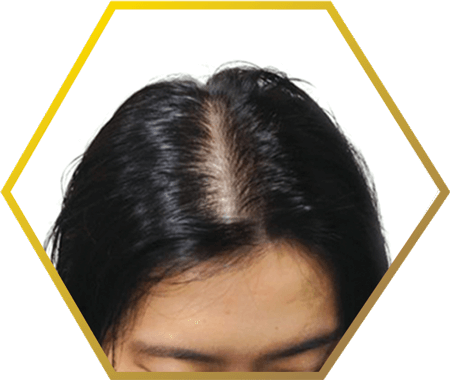 Female pattern hair loss is a condition that occurs in women who suffer from androgenic alopecia. Affecting up to forty percent of women by age 50, it begins with patients noticing a thinning of their hair, along with obvious signs of shedding, such as more hair fall in the shower, in their hairbrush, and on their pillow when they wake up in the morning. Unlike men who suffer from male pattern hair loss, the signs and symptoms in women are more pronounced. Where men will notice thinning in certain areas of their scalp such as temples and crown, women with female-pattern hair loss will notice hair thinning all over their scalp with more loss occurring on the top of the head, causing a widening of the center hair part. The one piece of good news about female pattern hair loss is that rarely if ever does it lead to complete baldness as it does for men. The anagen phase is the active hair growth phase. During this phase, the cells of the hair root rapidly grow and divide. Once a new hair forms, it will push upward out of the follicle. If there is already a hair in the follicle (known has a ‘club’ hair), that hair will be pushed out, or shed. This shedding is part of the normal cycle. The new hair replaces and becomes the ‘club hair’. During the anagen phase, the hair will grow approximately one centimeter each month. This active growth phase will last from two to six years. You may have friends, or perhaps experience yourself, the inability to grow your hair beyond a certain length. This usually means that you have a ‘short anagen’ phase. Naturally, people who are able to grow their hair very long very quickly, have a ‘long anagen’ phase. Obviously, the length of the anagen phase is different in other parts of the body. Eyebrows, eyelashes, body hair – under normal circumstances, these areas will have a very short anagen phase. During the Catagen phase, growth of the hair stops. The outside root sheath of the follicle will shrink and attach itself to the root of the hair. The telogen phase is what we consider to be the ‘resting’ phase of the growth cycle. During the telogen phase, which lasts for approximately 100 days, the follicle is at rest, and the club hair is completely formed, with a whitish bulb at the root (noticeable if you were to pull a telogen hair out and look at the root). It is normal to shed between 25 and 100 telogen hairs each and every day. 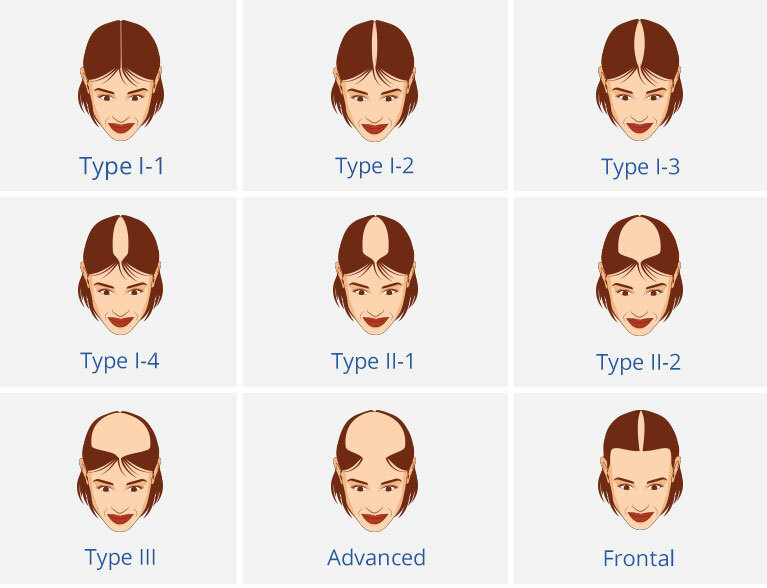 The Ludwig Scale can be used to categorize typical hair loss patterns in women. Some amount of hair loss is natural as we age, whether we are male or female. Hormonal changes can lead to female pattern hair loss. For women, especially those who are going through or who have already experienced menopause, the likelihood of experiencing hair loss is much greater. In particular, changes in androgen levels (male hormones such as DHT) are responsible for not only hair loss on a woman’s head, but increased and coarser hair on other parts of her body. If someone else in your family such as your mother, father or grandmother suffered from female pattern hair loss, you are more likely to develop the condition yourself.